Rock of Offence: What Do Muslims Think of Jesus? The well-known narrative of the evangelist Luke relates the birth of Christ as a special event that took place here on earth. It tells of a young mother, a modest and unsophisticated woman. During the night, in the presence of her supportive husband, she laid her newborn child in a manger. Lowly shepherds left their flocks in the fields of Bethlehem in order to visit the child. Certainly, the birth of Christ is a story that belongs to this earth. Yet, it belongs to heaven too, for it reveals heavenly, miraculous occurrences: the appearance of the angel announcing the birth of the Savior of mankind, the manifestation of the glory of the Lord, and the singing of the heavenly choir. Moreover, the child in the center of the narrative is of supernatural origin. He left his heavenly home and came to this earth. Full of love and grace, God came to this world in the person of his Son. God the Son remained what he was, divine, and he became what he was not, human. In other words, God became man. From the Bible's point of view, the end has already arrived. There is a sense in which we are living with and in the end, whether we like it or not. To understand the end that will be, we must understand the end that already is. We turn, therefore, to the theme of Jesus' preachingthe kingdom of God. We turn, in fact, to "the beginning of the end." The Bible believes in a divine Savior, and a divine Savior can be expected to come in a remarkable way. It is a presupposition of New Testament thought which needs no argument, nor many references. The only accounts we have in the New Testament of the virgin conception of Jesus appear in the gospels of Matthew and Luke. The single-celled embryo, at the moment of the fusion of egg and sperm, brings together two sets of genetic information from mother and fatherin the form of the DNA code which, when spelt out letter by letter, would fill twenty-four volumes of the Encyclopedia Britannica. These twenty-four volumes are packed into the nucleus of the cell, which is one-5,000th of a millimeter in diameter, which cell has the ability to replicate itself within a few hours and divide billions of times, eventually producing a fully formed human being. 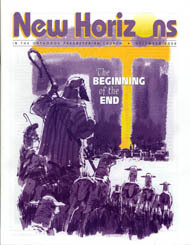 Readers of New Horizons may be familiar with Henry Coray's Against the World: The Odyssey of Athanasius (1992). This is a brief, popular (albeit fictionalized) biography of the champion of Nicene orthodoxy. An inveterate defender of the Nicene Creed (A.D. 325), Athanasius has been revered by the church catholic for his unswerving insistence on the deity of the Son of God. Name above all names. The Way, the Truth, the Life. King of kings and Lord of lords. These traditional, biblical phrases express the depth of Christian devotion to Jesus. The final word in the Bible about human fulfillment is found in Revelation 22:4, where the bliss of eternity is described in the simple phrase "They shall see God's face." That means we will be in relationship with God in a personal way; we will be in his presence, speaking with him face-to-face. This is the culmination of the human story that began in Genesis 1 in the Garden of Eden. God's purpose in creating man was that it would culminate in full fellowship in heaven when we will see God face-to-face (Rev. 21, 22).